Augmented Reality is the real time display of interactions of superimposed audio, video, graphics and other advanced effects over the real-world environment. You are scratching you head, trying desperately to conjure up the how you are going to drive footfall and increase dwell time into your neglected public space. That awkward space, where many people are in transit to somewhere else. It needs to be an experience, that is informative, educational and most importantly memorable. The writing pad by the side of your bed is empty. It’s the pad with all your best ideas that come to you in the middle of the night. You need to write it down quickly before it disappears into the ether. Then it comes to you!! Why not create a world of interactive 3D characters, projected in real time using data shown by a computer or smartphone. Blending the virtual world with physical reality. Genius, everyone has a mobile smartphone, right? 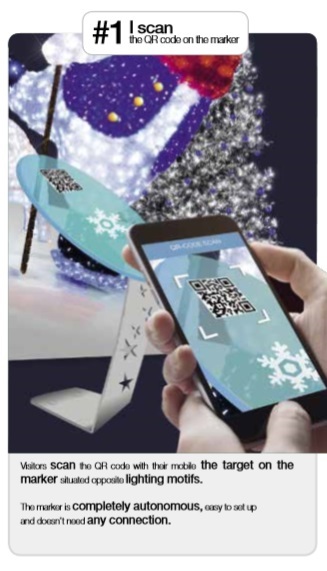 A world of interactive 3D gaming featuring virtual characters, superimposed over your set designs (Santa, Polar Bear, Reindeer, Sleigh …you get the picture) via a mobile app which is very easy to use. These characters or images, can be accessed by scanning the Augmented Reality terminal which is provided in the area where the set design is installed. Give your visitors the chance to experience a world of games that blend the virtual and real worlds for a fun and different experience. Once the games are over, users are offered the chance to share their experience by posting a souvenir photo, featuring the city’s logo, on their social networks or by texting. The application, is fully customised enabling the app to have your City’s name and logo and/or slogan appear on the application’s pages on the smartphone as well as on any photos shared via the app via social media or messaging.